How can you grow your wealth, by investing or by entrepreneurship? Can you be both? 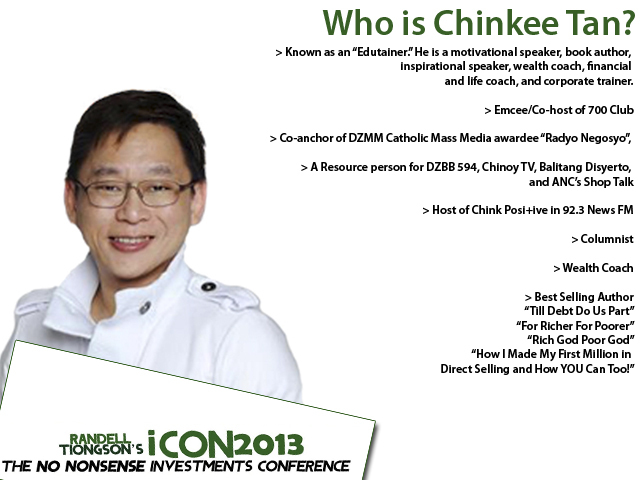 Learn from the Wealth Coach, Mr. Chinkee Tan on how to grow and invest through entrepreneurship at the iCOn 2013: The No Nonsense Investments Conference this June 22, 2013 at the SMX. Chinkee Tan is one of the most sought after speakers and coaches in the arena of growing your wealth. He is a best-selling author, award-winning radio show host and a true mentor to thousands of Filipinos including me.